I recently combined a Baofeng UV-3R with a Mobilinkd KISS device that plays nice with my smartphone running APRSdroid as described elsewhere in this gallery. However there are times that I have a need for a small bi-directional device without requiring the need for my smartphone running APRSdroid to be part of the package, and case in point is another project that I'm in the early stages with, and I'll talk more about it at the end of this post. 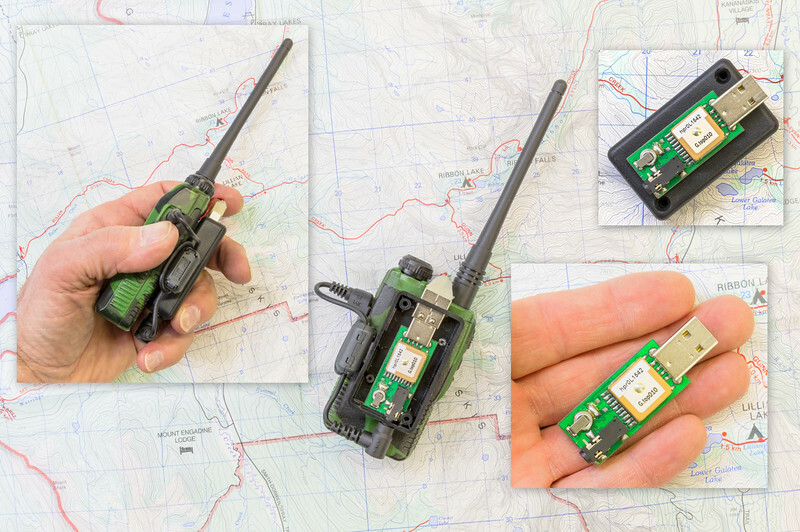 So I spent some time sourcing small TNC's that would do what I had in mind, and one device that I was aware of made by Argent Cable Data Systems, is the T3-Micro, a complete stand alone TNC dongle with included GPS receiver, that is basically the same device as the full size Tracker 3 OT3m TNC that I also am familiar with, as I use one with my APRS weather station VE6AB-8 mounted in the cargo bay of my mobile. After ordering a T3-Micro from Argent Cable and getting my first look at it, I realized there is lots of potential for various ways I could put it too use. The first thing I had to deal with is the fact that the T3-Micro comes without a case, so I scrounged around in my junkbox till I found a case that it fitted in once I cut openings at either end for the USB connector and the cable connector to be accessible from the outside of the case. The next problem to address was whether or not the T3-Micro rated for 5 volts and powered through the USB connector would operate on 3.7 volts, the voltage of the battery located within the UV-3R. The reason why, is because down the road, and because of weight restrictions of the project I'm in the early stages of, I hoped to power the T3 Micro with the smallest 3.7 volt li-ion battery possible in capacity and size wise for the application that I have in mind. With a 3.7 volt battery temporally connected to the T3-Micro, I discovered it was quite capable of operating from a 3.7 volt battery as a power source, so the next step was to run wires from the battery located inside of the rear battery compartment of the UV-3R, and connect them to the USB connector located on the T3-Micro. The 1500mAh battery that powers the UV-3R has proved to be up to the task of powering both the UV-3R, as well as the T3-Micro TNC. With a cable put together to mate the two devices, I was good to go, as now I have a complete stand alone transceiver/TNC that works as I wished for, and if I am not getting into a distant digipeater, I leave my mobile parked at the trailhead set as a fill-in-digi kicking my beacons up into the APRS network. 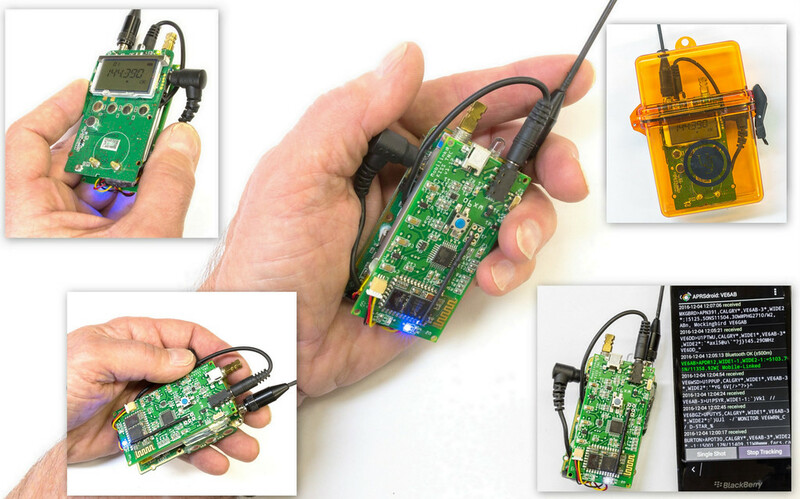 If your not aware of the potential of the T3-Micro, or its bigger brother the Tracker 3 OT3m, is the fact that either of them can be configured to operate as a regular TNC, but may also be set up as a digipeater, or even configured to pair with an APRS weather station electronics module, as I have going on with my VE6AB-8 weather station mounted in the cargo bay of my mobile, the OT3m delegated to GPS duty, and passing data from the ADS-WS1 module to a distant digipeater, as the Argent Cable weather station electronics package was not designed for mobile use, but with the use of the OT3m, this allows me to operate my APRS weather station from my mobile set up in temporary locations. Also, both of these devices allow for remote access via text messaging for making changes to the settings from any APRS device with messaging capabilities. This is done by adding the callsigns with access permissions to the access list within the software of the device, when either of these two devices are connected to a computer with the config program loaded on the computer. Once commands sent to the T3-Micro remotely from another APRS device are received by the T3 Micro, and the callsign in the packet string has permissions to make changes, the commands are accepted regardless of the fact the packet-string may have been digipeated by a second digipeater while in route to the T3 Micro. Programming is a quick procedure with either device, but especially so with the T3-Micro that connects to the computer via a USB port that it plugs in to directly, then its as simple as opening the config program, and clicking on connect. At that point the settings screen for the device is front and center available for making additions or changes to, and then clicking on "write" to make the changes...Done. As I mentioned at the beginning of this post, I continue to run tests with the T3 Micro, and of course you should know that much of the testing that I have been doing with tiny TNC's and continue to run tests on, is in preparation of placing an APRS package in my radio control sailplane, an event that will happen some time in the near future, although for the moment I am waiting for another needed part to arrive, allowing me to complete the package to be placed in my RC sailplane.......stay tuned.